Gareth Moore in action for Dewsbury against Halifax last season. PIC: Paul Butterfield. Former Halifax RLFC half-back Gareth Moore has announced his retirement from rugby league at the age of 29. Moore first appeared for Halifax in 2009 while on loan from Leeds Rhinos. He secured a permanent move to the Shay in 2016, after spells with Wakefield Trinity, Featherstone Rovers and Batley Bulldogs. He spent one full season with Halifax before leaving for Dewsbury Rams part way through the 2017 campaign. The half-back has been with the Rams since, playing a pivotal role in their survival in the Championship during the 2017 season. In 2018, Moore's campaign was marred by injury. 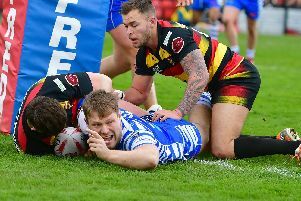 He played just nine games for Dewsbury and has decided to quit the sport to focus on his career outside of rugby league. “It comes with a deep heart that I have to retire from the game I have loved since I was four years old," said Moore. “I have a fast-growing business which takes up all of my time, and the commitment of being a semi-professional rugby player isn’t easy while doing this. "I’d like to thank all the clubs that I have played for and coaching staff that have had to put up with me along the way. “I have met some great people and made some friends for life through the sport and this wasn’t an easy decision." Meanwhile, one of Moore's former club's, Featherstone Rovers, have terminated the contract of head coach John Duffy. Rovers, who were pipped to a place in the top four by Halifax last season, said in a club statement that Duffy had failed to turn up for pre-season training. 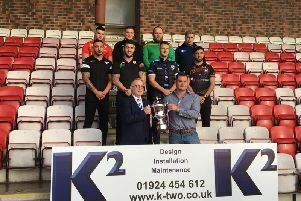 The former Swinton Lions boss was heavily linked with a move to Leigh Centurions but Featherstone now say they are taking legal action against both Duffy and Leigh. "Duffy was due to attend work last Monday-12 November 2018, which coincided with the first day of pre-season training," read a club statement. "Unfortunately he failed to attend work and has not done so in the time since. "The club have taken legal advice in relation to issues surrounding Duffy’s conduct and have today terminated his contract, as a result of his actions of gross misconduct. "It is disappointing that the club has had to take this stance, especially after Duffy was awarded an extension to his contract, through to the end of the 2020 season. "It also appears that Duffy has been engaged in discussions with Leigh Centurions, to take over as head coach. "Formal action is now being taken against Duffy for breach of contract and Leigh for inducement to breach contract."